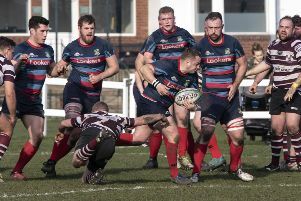 South Shields Westoe cruised into the semi-finals of the National Intermediate Cup with a pitch-perfect performance against Bowdon, winning 76-14. In a first half demolition of Bowdon, Westoe scored seven tries and 43 points, playing the best consistent rugby of their season. Westoe’s pack dominated in all areas and the side played with confidence, allowing some great handling and fast open play. Bowdon currently play in Lancs/Cheshire League 1, the equivalent level to Westoe, and are league leaders and primed for promotion at the end of the season. The visitors had only lost on two occasions this year and were probably not expecting the rampant display from their hosts. Straight from the first whistle, Westoe turned on the pressure after Bowdon cleared the kick-off. The line-out was taken cleanly, set-up and driven towards the line. Bowdon managed to drop the maul short, but Westoe’s short handling and recycling was accurate and after several phases and drives from Sam Hughes and Raymie Elliott, saw Paul Evans cross to score with under a minute played. Bowdon came back strong, applying pressure of their own, but the Westoe defence was on song and camped on their own line, resisted a barrage of close drives from the visitors. Mounting pressure looked like it may pay off after several minutes of assault, but constant tackling and a stripped ball allowed Westoe to clear the lines and nullify the early threat. Still in their own 22m, Sam Gaff broke free and charged down the slope and flicked the reverse pass to Paul Evans, who almost made the line, but was tackled short. Chris Judson broke quickly from the ruck and a second inside pass found Raymie Elliott, unstoppable with 10 metres to go to make it 10-0 to Westoe. 15 minutes in and a line-out steal led to a series of Westoe drives from Elliott, Derek Worthington and Ryan Lamb, eating the territory and dragging defenders in. With spaces appearing, the ball was spun wide for Mikel Tate and on to Luke Moffett, who sprinted the last 30m into the corner, outpacing the speedy Bowdon full-back Agyei-King. More driving play from Louis Kellett, Lamb and Worthington again gained territory and set up a powerful break from John Younghusband, with Paul Evans providing the link to flanker, Alex Wylie running in support for the converted score. 25 minutes played and it was a case of déjà vu, with drives from Andy Kirton and Kellett, with Worthington breaking the line and delivering the short offload to Joe McKenzie on an angled run to the line (converted). What appeared to be their first mistake of the day turned into score number six, with McKenzie scooping up loose ball from the restart and passing to Gaff, who strode all the way to the posts (converted). Bowdon’s day worsened with the wind holding the restart kick and giving Westoe the scrum. A Gaff pick-up and Judson run, took the ball close, with the defence forcing the mistake and earning their own scrum. Westoe’s pack attacked the scrum, turning over the ball for Alex Wylie to pounce and end the half with a converted score, 43-0 at half-time. A reinvigorated Bowdon came out after the whistle, now playing down the slope they held the ball well and strung together a dozen or so phases, switching between close-up drives and spinning the ball wide. However, Westoe’s line-speed and defence forced another error and they regained possession. A Bowdon ruck offence gave Westoe the penalty to the corner. A clean Younghusband take was driven to the line, but collapsed just short, but Lamb and Kellett smashed through the remaining defenders for Lamb to claim the touch-down and the half century after 10 minutes of the half. With the game all but won, the intensity and accuracy of the home side tailed off slightly, allowing Bowdon, who never gave in, more time in possession and the opportunity to attack. Despite this, Westoe continued to pressure the visitors and forced errors and turnovers nullifying several scoring opportunities. Andy Sutherland read the play and intercepted a long pass, taking the ball to the oppositions red zone and giving the offload to Haydn Richards to cross the line, dragging a defender with him. With Westoe attacking again, Bowdon’s Njang-Ako-Oben stripped the ball and after a series of drives, the ball was spun out wide for young winger, Briscoe, to show his pace and sprint under the posts for the visitors’ first score, converted to see the score 55-7. Westoe remained in control of the ball and gained territory from some long Sutherland kicks and their relentless forward surges. A McKenzie break went a full 70m, with John Younghusband on hand to receive the pass, only to be brought down short of Bowdon’s line. Another rare penalty gave Westoe a line-out on the five metre line. The catch and drive this time unstoppable, with Paul Evans adding his considerable weight at the back, touching down for try number 10 (converted). The restart proved to be the worst period for Westoe, whose lazy play gave Bowdon’s Hargreaves-Connolly the opportunity to steal loose ball and show his strength in blasting through the home side’s defence. Converted for 62-14. With the clock ticking down, Westoe’s Sutherland gave another inside pass to Sam Hughes, giving him the opportunity to show his pace and power, scoring try number 11. The final play and score of the match came from another Hughes run down the touchline, where a recycled ball found Joe McKenzie, who crashed his way through to finish off a man-of-the-match performance and score his second and Westoe’s 12th try of the day. Converted for a full-time score of 76-14. Unfortunately for Bowdon, they met Westoe at their very best and struggled after the blistering first 20 minutes. Westoe now progress to the semi-final of the National Intermediate Cup and will face Kenilworth, winners of the Midlands Divisional Cup. With only one step to go, Westoe are gearing up for another visit to Twickenham after their last appearance in 2005, and if they can continue with the same intensity, patience and accuracy, they stand a very good chance of fulfilling the dream.